Honber Industry & Trade, an ISO-certified company in China, supplies magnetic card, keypad, and hotel safe. Being recognized as a professional manufacturer in the security industry, Honber develops rich experiences in innovation. We are confident of offering quality and cost-competitive products to costumers. Honber is a Hotel Safe supplier with good reputation of offering high quality security products includes digital, Electronic, and wall ones, etc. Comfort and security—these are the basic requests for a good accommodation; moreover, the product with high security will be a plus for your business than a normal one. For customers deciding to stay in your accommodation, the hotel safe could be an important factor to affect the image of your business. 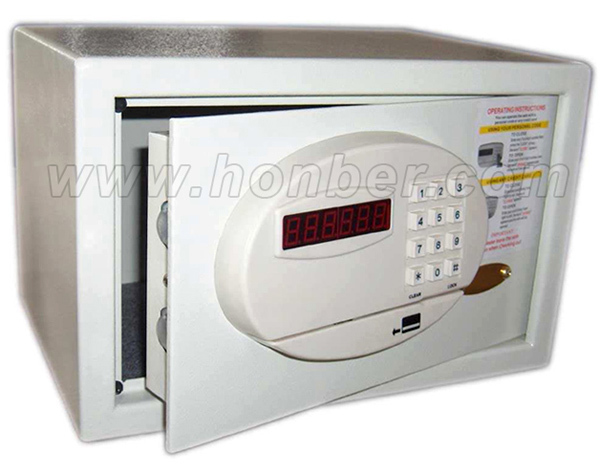 Considering of what mentioned above, the Honber hotel safe product is designed with two levels of code management, and it also has the magnetic card opening function. The intellectual management controller can be added in the safe for code, so that you can use any credit card as the key after setting the hotel safe. What’s more, the latest 100 pieces of opening record can be read on LED screen and printed by computer; it's easy to check anytime when necessary. This product is designed with many convenient functions for both customers and managers. Taking the Honber hotel safe as your first choice, you can have the best product with powerful function and create better image of your business at the same time.